We had so many gorgeous entries this month! The black, white, + one more color, was a hit! Thank you to all who entered. Are you excited to see who won this gorgeous stamp set? We used random.org to choose a winner. #9 is Molly U. from Daybreak Crafter!!! Congrats! 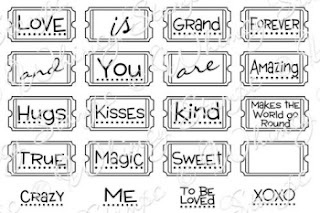 Please email lora at onecrazystamper dot com to claim your stamp set!! Please check back tomorrow for a new challenge! 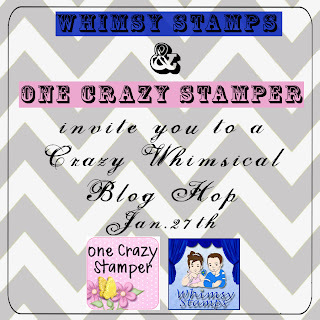 Thank you to all who participated in the Whimsy & One Crazy Stamper blog hop! It was a success and both DT’s did a wonderful job. Since our link tool was being “difficult” at the first of the blog hop, I wrote all the names from Inlinkz and commentors who couldn’t use the link tool. I had a very cute 2 year old and a big strong handsome 5 year old pick a name off the list. And the winners of the Whimsy stamp and dies are……. Each has won the stamp set and coordinating die! Please email ( lora at onecrazystamper dot com) to claim your prize. You have until tomorrow to enter the OCS January Challenge! And on Feb 1st our new challenge will be posted! Thanks for joining us! 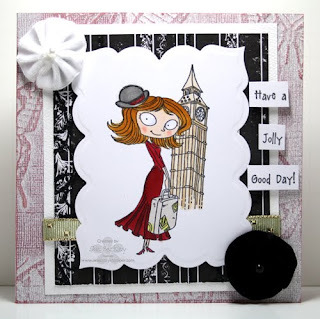 I have some more Whimsy for you today for One Crazy Stamper. I got all excited the other night and made this card before I realized that we had a sketch for our Crazy Whimsical Blog Hop! No matter...I will share my first creation today! 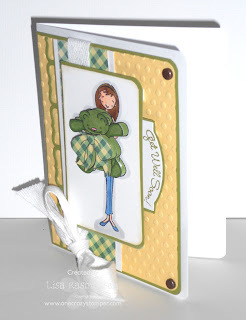 I used May Arts ribbon, a touch of piercing and some Candi to embellish my card. I colored the Spring Zebra image with the following Copic Markers: W7, W5, W3, E44, E43, E41, YG17, YG03, B45, B41, Y38, R85, R83, R81. Hi Everyone! It seems that winter has finally come to the Brampton/Bolton area of Ontario today as it is blowing snow and very windy. Hope everyone has had fun playing along with the Whimsy stamps and One Crazy Stamper blog hop that started Friday, January 27th. As two prize winners (a stamp set and matching die each) will be chosen on Monday, January 30 there is still time to play along. 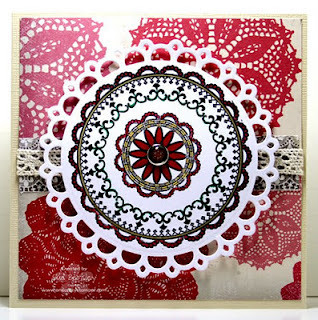 For my post today, I have used a border and center set called Grandma's Doilies from Just Rite Stamps. I have used a combination of copic markers and Sakura Gelly Roll Stardust Glitter Pens. There are still a couple of days to play this month's challenge which is Red, White + one other colour of your choice. Wednesday, will be the start of a brand new challenge. Don't forget to check out Lora's store OCS for all the amazing new goodies that are arriving daily. I am sooooo sorry I am late today with this post! his week has been INSANE! I started a a local University this week and I planned on taking care of all last minute details on Monday. Oil change, grocery shopping, looking at the map of the HUGE campus to figure out where to park and to figure out where my classes were located. While at the dealership waiting for the car to be completed I was passing time on Facebook and I saw a post about the university welcoming students back for the first day of classes. WHAT?!? School started on Tuesday it was marked IN INK on my calendar I was all planned out! I called the University and NOPE classes actually started that day. OH MY! So My car was completed and I rushed home and through a few things in my backpack and ran out the door to drive to school (about an hour away) and it really was a sink or swim moment for me! I was about 15 minutes late for my first class and 20 minutes late for my second class and it was a VERY insane day. I really hit the ground running and feel like I haven't stopped since! OK so that has been my crazy week and that is why I am late posting! Here is my card featuring the fight like a girl a la mode by My Favorite Things. his is just a simple card! I made this for a friend of mine that will be celebrating a year in remission on Tuesday. I hope you guys a have a fabulous upcoming week and you still have a few days left to enter in this months challenge! We have a new challenge on Wednesday! 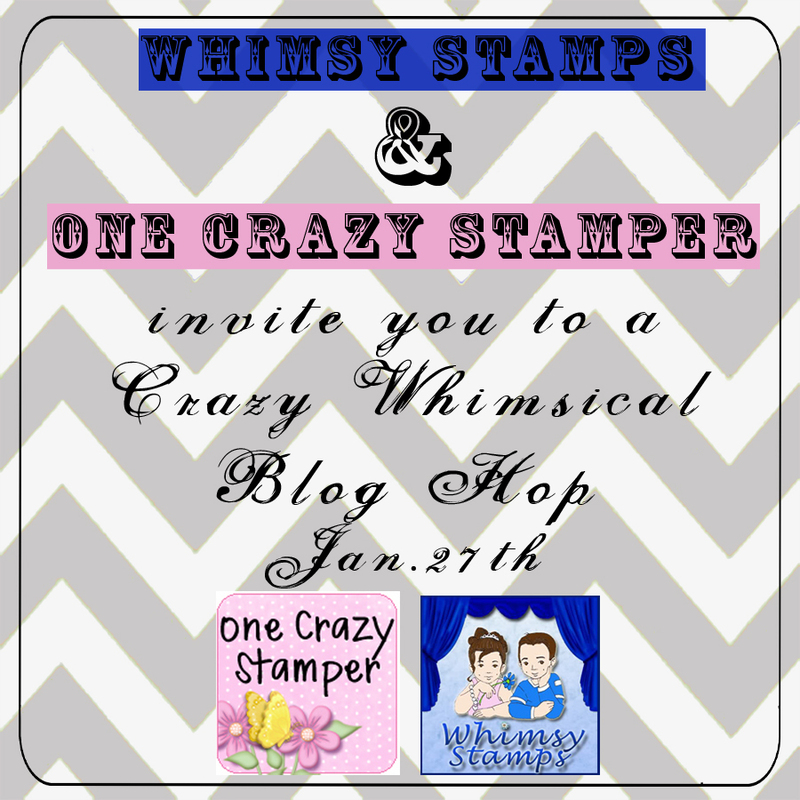 Today Whimsy Stamps is combining forces with One Crazy Stamper to bring you a Crazy Whimsical blog hop filled with lots of inspiration and some PRIZES!! Please join our hop featuring projects from the Whimsy and One Crazy Stamper Design Teams. Be sure to hop around from blog to blog and leave a comment at each stop, because there are prizes to be won along the way!!! 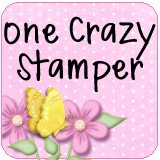 **To be entered to win one of 2 fabulous prize from the One Crazy Stamper store. Please leave your name in the Inlinkz tool below and become a follower of the OCS blog. If you are on facebook, we'd love if you'd become a fan of One Crazy Stamper on Facebook (optional)! Wanna see what we are giving away to 2 lucky blog hoppers?! We are giving away 2 sets of the following. Both the die and stamps are included!!! Winners will be drawn 1/30. Here is the order of the hop! Happy Hopping! Hi, Madge here for another Wonderful Wednesday. This week the thermometer has climbed and I’m not feeling like such a bear. In fact, I’ve chosen a stamp from YNS (Your Next Stamp) featuring Ellie Loves to Ski. I started by stamping the image onto Copic Xpress Blend it cardstock with Memento Tuxedo Black ink, colored it with copics, and cut it into an oval to fit over the Spellbinders largest Lacey Oval die. The DP’s are from Bo Bunny “Gift of Love” collection. I used SU cardstock to layer the card and for a card base. The trees are from a previous project. They were embossed with white on white, then I added 3 tones of green copics. I dabbed on white Embossing Paste and sprinkled it with Glitter Ritz Cool Tone while it was still wet. For the metallic looking goggles, I used a very favorite Sakura Stardust Pen – they don’t dry out and last forever. (No need to buy different colors – as the sparkle turns any color to sparkle……They are the Greatest!! So that is it for another Wednesday – hope everyone is well and taking time to do a little stamping. 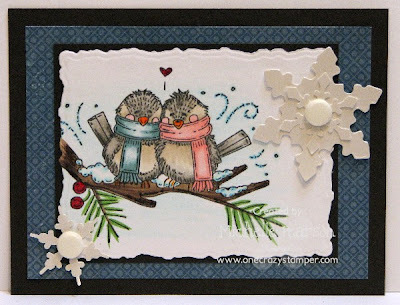 On Friday, stay tuned for a joint Blog Hop with our friends from Whimsy Stamps and our OCS Design Team. It should be lots of fun . 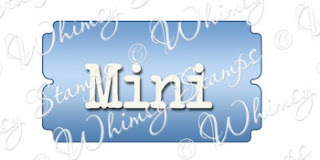 . . . . and it will showcase the Whimsy January 2012 New Releases. Be sure to join in on the fun! My last post this month for the challenge here at OCS, and as a reminder of the theme of the challenge this month my card is RED/WHITE and the color of my choice, black. My card features a My Favorite Things stamp entitled "Fred Bear, Snow Bear" one of my favorite images from MFT.﻿ As usual the image was stamped on Copic Xpress It blending paper with Memento ink and colored with Copic Sketch Markers. 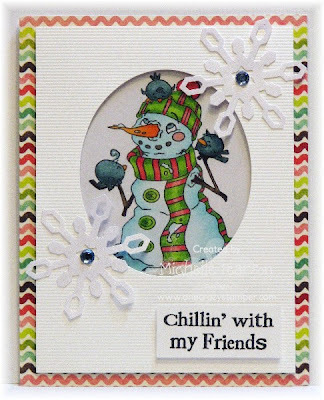 The red cardstock and the snowflake were embossed in my Cuttlebug with embossing folders, and the snowflake was inked and glitttered. 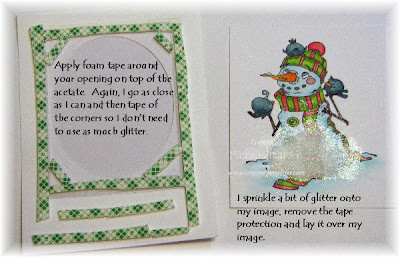 The Snow Buddies sentiment was handwritten with Art Glitter Designer Dries Clear Adhesive and Metal tip, then both the sentiment and the snowflakes were glittered with the Cool Highlights Glitter Ritz. Today I'm sharing a tutorial on Shaker Cards for One Crazy Stamper. For my card I used Chillin' With My Friends stamp set from Kraftin Kimmie Stamps. 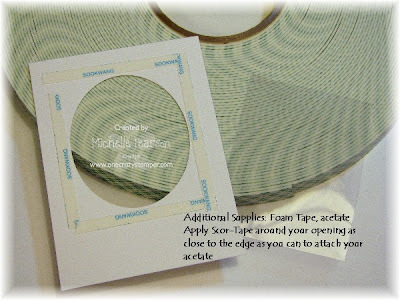 My tip: Recycle acetate from your packaging for your windows! 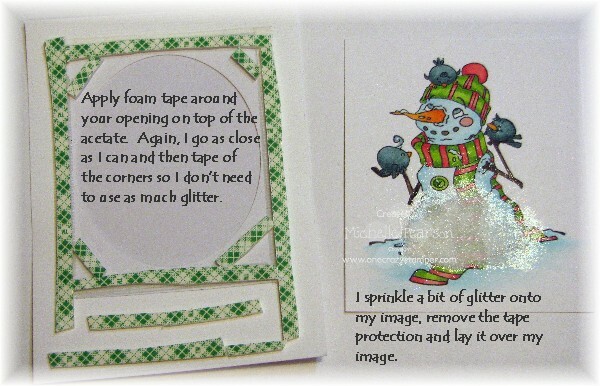 Tip #2: Angling the tape in the corners helps reduce the amount of glitter used and helps seal your seams so you don't sprinkle glitter when you shake your card! I attach my taped layer over my image panel/glitter on a craft mat to avoid things sticking where they should not stick! Then simply finish your card as you wish! I embellished my card with a Martha Stewart Icelandic Snowflake Punch. Have a Jolly Good Day!!! It's time for my Sunday post here at OCS. I have used another amazing stamp from Kraftin' Kimmie called Elaine. The sentiment that comes with this stamp set is "Have a Jolly Good Day!" and I hope everyone is having one; which has me wishing that I could take a trip to Jolly Old England. Maybe one day soon. The cardstock that I used for the card base is core'dinations which can be sanded. This particular piece had embossed butterflies and turned red when sanded. A very cool effect. Do join our challenge this month which is Red, White + one other colour of your choice for a chance to win a stamp set from OCS. While you are creating your project, check out all the amazing new goodies that are arriving at Lora's store OCS. ICK I'm later and feel better! It has been such a busy, busy week here! I enjoyed my vacation so much from school but this last week I have been making sure I have everything ready to be able to start school this next week. It is hard to get back into school mode! I have been enjoying being a bit lazy and I cleaned my stamp area. If you couldn't tell I am completely IN LOVE with this MFT A LA MODE! I have used this for a welcome baby, a seasons greeting and a get well soon card! It really comes down to the sentiment so have fun with all the different images! I layered this a lot and stamped the bear twice. once on copic paper to color and the other on Cosmo Cricket Design Paper for the bow and I used pop dots to layer it all. the twill ribbon, brads and dies are all from my stash! 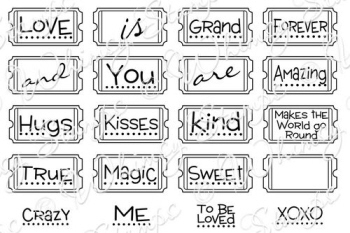 I am just loving these new stamps from Kraftin Kimmie available at One Crazy Stamper. This is the Red Queen. I stamped her with Memento Black ink onto Express It card stock and colored her with copics: R20, R22, R24, R29, C5, C7, C9. I placed white dots with a white Ultra Fine Posca Paint marker along the border of her dress. Then I cut her out and layered her onto a die cut. I added a lime green accent ribbon. Check out and join our red, white plus one more color challenge! 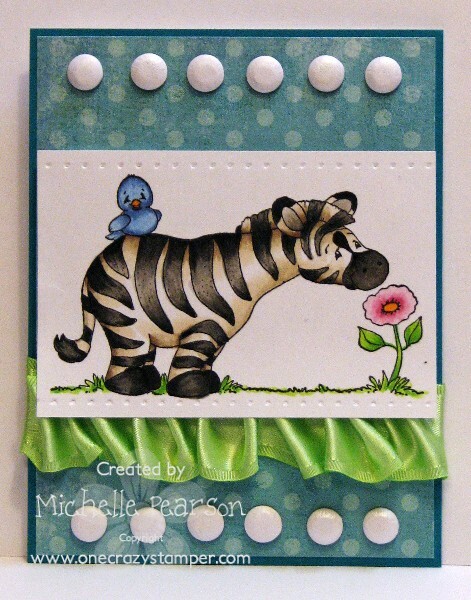 Do you love Whimsy Stamps? And do you love One Crazy Stamper?! 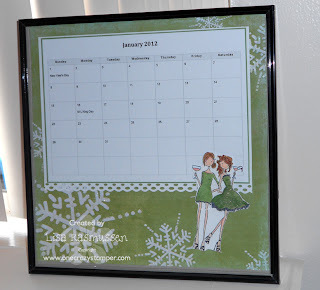 If so we'd love for you to join us Jan. 27th for a Crazy Whimsical blog hop!!! We promise to have lots of inspiration from the newest Whimsy release!!! Feel free to take our badge to spread the word and see you here on 1/27! – I’m trying to hear an echo through all the snow that is piled up down our driveway, and from here in the “frozen” (baby it’s cold out there!!!!!) interior of BC. BRRRR! Ok, I KNOW we need the snow……… just shut up already! We have a perfectly good ski hill 20 min. north of us…. Can’t the snow stay up there?? OK, I’m not here to whine…… (oh yeah?) 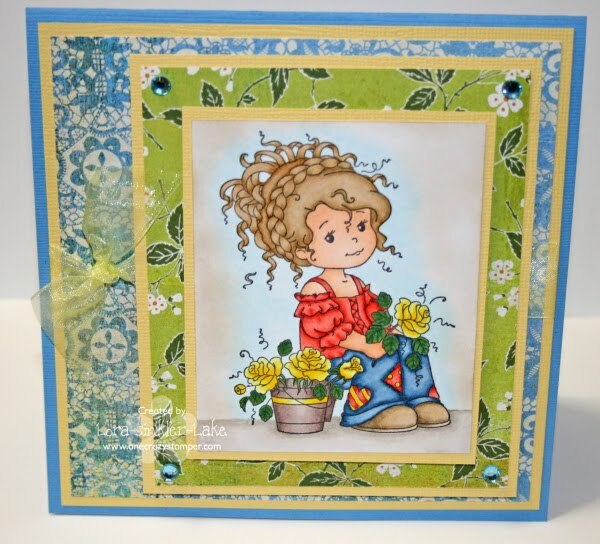 On the brighter side I have a cute card to show you today…… It’s a Whimsy Stamp from the Kenny K collection, called Bbbbbbiker Ggggggirl(brrrrrrrrrr, baby put some clothes on !!!)….. I can only hope she is in a nice warm climate!! I really love the Kenny K Collection of stamps……… they are so much fun to put to paper. Ok, I’ll quit funning with you and get down to some serious stuff . . . . . maybe. Recipe: Xpress It blend Copic cardstock, Memento Tuxedo Black ink, Copic Markers, (YR23; Y17; Y35; YR16; BG93; BG11; BG75; E11; E13; E17; E19; E01; E02; R20; C1; C4), Spellbinders, Labels Eighteen, Buttons, Sissix Die and Texture Plate, TH Mustard Seed Distress Ink, Ranger Crackle Accents (fun stuff!! ), misc. cardstock, thread and punchies from stash. (See the close up of that crackle accent). OCS is having a marvelous themed challenge for the month of January . . . . A RED, (WHITE and ONE OTHER COLOR!! There are prizes to be won!! Hope you’ll show us what you’ve created! 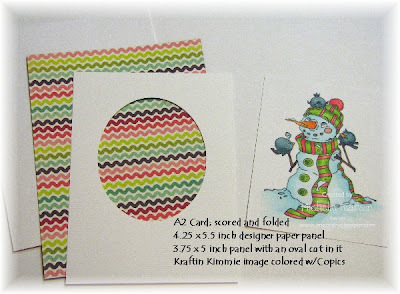 It's time for my Terrific Tuesday post at One Crazy Stamper, and this week I've chosen one of the boys from Kraftin' Kimmie's Snips and Snails set to color. 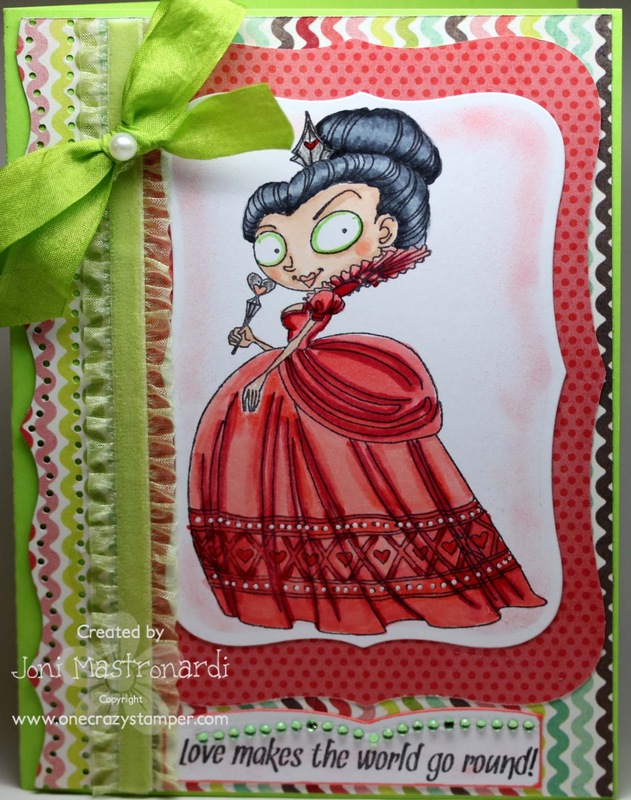 The image was stamped with Memento Tuxedo Black Ink on Copic Xpress It paper, colored with Copic Sketch Markers, and cut with Spellbinders Wonky Squares. The stitches were drawn with a Copic Multiliner, and the sentiments are Whimsy Stamps Mini Love Tickets and matching Mini Ticket die. The dp is from the Ad Lib paper collection by Bo Bunny, ribbon and brads are from my stash. 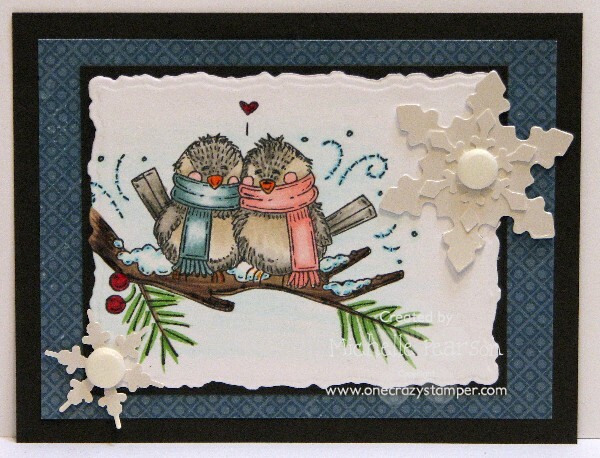 Today I have a cozy little card for you featuring the Cozy Little Chickadees image from Whimsy Stamps. I colored my image with the following Copic Markers: BG0000, BG000, BG10, BG70, BG72, B00, E49, E47, E44, E43, E42, W5, W3, YG67, YR16, R89, R29, RV42, R20. What a perfectly fun image for a friend....or an anniversary! Hi All! It's Sue here and for today's post, I have used this stamp from La-La Land Crafts called Cheerleader Marci. 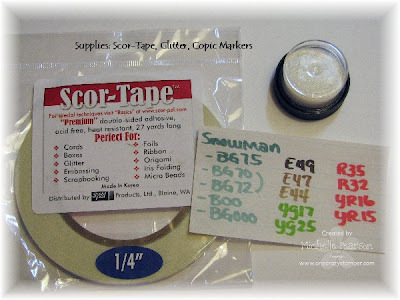 All supplies can be found at Lora's store One Crazy Stamper. Do check out the amazing new stuff that is arriving daily. 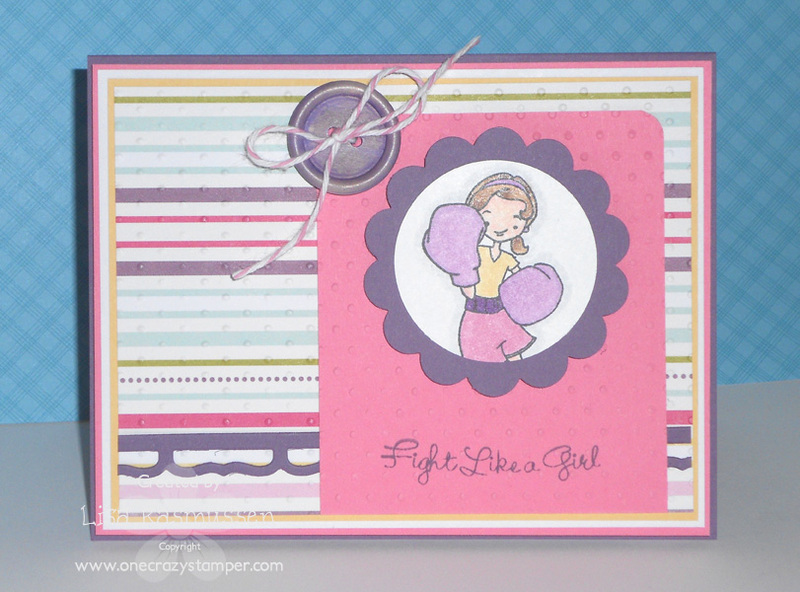 Don't forget to enter this month's challenge for a chance to win a stamp set from OCS. Hi all! I was at one of the big chain stores over the holidays and they had a bunch of 2012 calendars and these 12x12 picture frames. I thought it would be a cute idea to make a calendar page for each month and then I can write any info on the calendar. 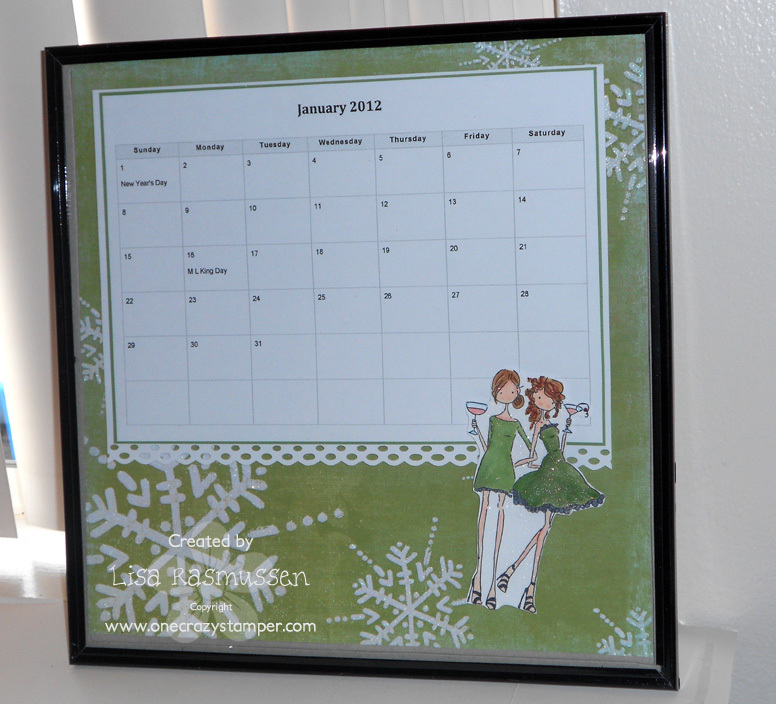 My plan is take photos throughout the month and do a 2 page layout following each month. I thought this would be an abbreviated version of that Project life I have been seeing everywhere. Before I commit to documenting weeks and days I need to see if I can do a short month in a view first. 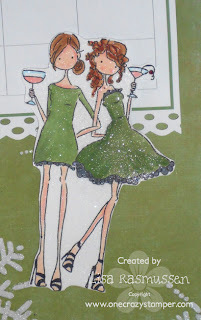 I used the super adorable Uptown Girls by Stamping Bella. I colored them in and cut them out. I then Tsukineko Shimmer Spritz! OMGosh am I in love with this stuff. I use a lid to an old shoe box and spritz away. there is sooooo much glittah and bling in one little spritz. It seriously made my heart sing with joy! Hope you enjoyed this weeks project!!! Our challenge this month at One Crazy Stamper is red, white and one more color. I went with red. white and pink, which seems to be a current theme. R29, R24 and R22. E11, E1000 and R02, C7, C5 and C3. I cut my focal image with a large oval nestie and layered it unto a scalloped nestie. I added a wide red, white and pink gingham ribbon with a large rhinestone. 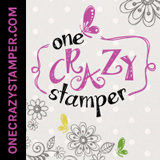 Check out all the new goodies at One Crazy Stamper. I think I need some pink sparkly boots, but I’m not sure where I’d wear them too?! Hi All for another Wonderful Wednesday! 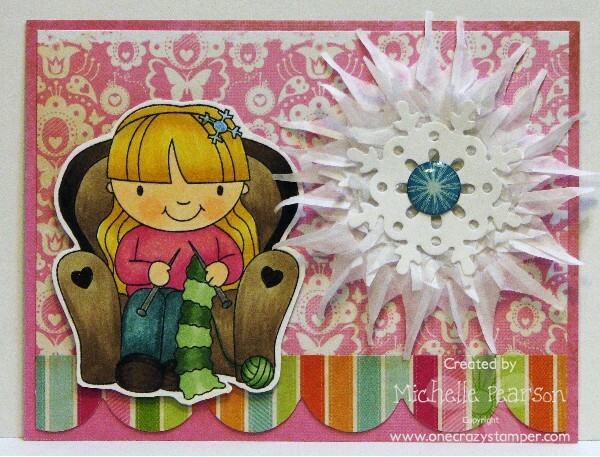 Today I’ve chosen a Magnolia Stamp called Tilda Sparkles available at OCS. A very dear friend is having a Birthday near the end of the month and I decided to do another “book card”. While we were away at Christmas I found some Hershey Nuggets (which I couldn’t find for my other Christmas book cards ….grrrr). To dress the nuggets, I made a wrapper for each of them by using a scalloped border punch, distressing the edges and adding a glittered snowflake (randomly). Here is a close up of Tilda Sparkles. Supplies used: Copic Xpress It Blend Cardstock, Memento Tuxedo Black Ink, Copic Markers, TH Antique Linen Distress Ink, TH Stormy Sky Distress Ink (still my fave), Zig 2-way glue pen, Glitter Ritz "Sand" and Glitter Ritz “Cool Highlights” , Flowers from OCS, MS Border Punch, SU Border Punch, Paper from Stash, SU Snowflake die, Pearl Snowflakes from stash. I have made a special envelope box for this – and it will be hand delivered! 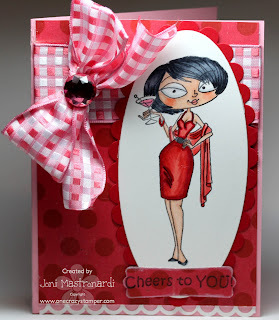 Welcome to my next card highlighting the theme for this month's challenge - RED/WHITE + ONE OTHER COLOR OF YOUR CHOICE. I choose the gorgeous Magnolia Ice Tilda to color for this card, and made it into a slider card so that she could glide across the pink ice! The image was stamped on Copic Xpress It paper with Memento Tuxedo ﻿Black ink, colored with Copic Sketch Markers and then fussy cut. The pink glittered background papers edge was punched with a Martha Stewart Around the Page punch, snowflakes are dies from Cheery Lynn, sentiment is a LOTV, and the ribbon and snowflake button are from my stash. The pearls that highlight the sentiment and the border of the card were made with the Ice White Viva Decor pearl pen. You have until the end of the month to enter the challenge for a chance to win a Craft Lounge stamp set! I just had to color up Ellie Loves to Knit from Your Next Stamp again! You can find Ellie and lots of her pals at One Crazy Stamper. I colored her up with Copic Markers and then cut her out leaving a small narrow border. I matched her to the KaiserCraft collection called Bubblegum Hills. 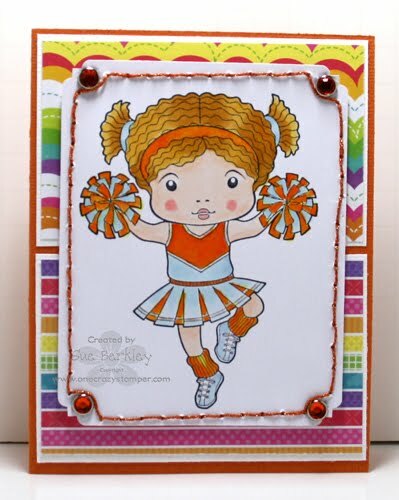 This collection is fun because it has fun die cut borders such as the one on the bottom of this card. My embellishment on this card is a snowflake rosette made with Honeycomb paper from Inky Antics. Lora has some on the way....so be sure to keep your eye peeled! 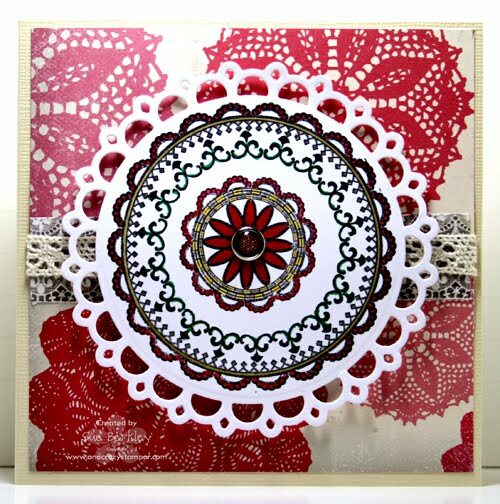 This stuff is fun, both in it's traditional use on HoneyPop cards and as fun borders and rosettes such as this! Jump start on next years cards!